has receptacle has a 3 prong. the plug on the electric range to match the wall receptacle. Or change the wall receptecle to match the plug on the electric range. Could you send pictures and details on how I would do this. If you could help please do . Congratulations! Your range cord is equipped with the new, four-cord pigtail, which is required by the latest National Electrical Code (NEC). Your outlet, however, is out-of-code and should be upgraded to the new four-prong style. Ok, here’s whatcha do. 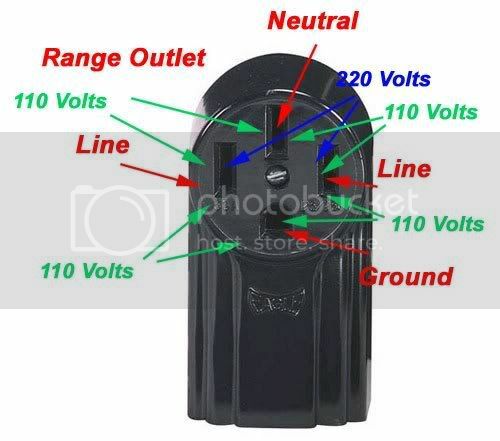 Feast your Vulcan squinties on this anatomy of your existing three-prong range outlet. If you were to remove the cover of that outlet, you’d see that the outlet box itself was tied to the neutral wire. This is a bozo no-no and is ezzacly what the new four-prong outlets are eliminating ’cause they require that the ground wire be separated from the neutral wire. 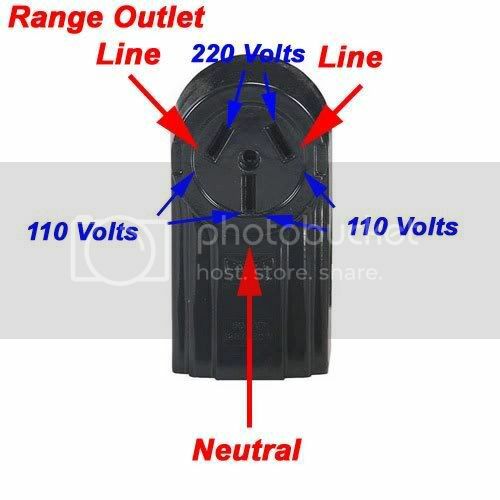 Here’s the basic anatomy of a typical four-conductor range outlet. One other thang. Since your existing outlet is out of code, the electrical cable from the circuit breaker box to the outlet will need to be upgraded, too. Your existing cable is probably 6-3W, meaning is has three, #6-gauge wires sheathed inside the cable. You’ll need to upgrade to 6-3W/G which includes a separate grounding conductor. Still got questions? We got answers in the Appliantology Group. Come see us. Fix y’up. Whatever. This entry was posted in Oven Repair, Range Repair, Stove Repair on July 22, 2004 by Samurai Appliance Repair Man.